The past couple of weeks have been hectic! I have been attending graduations at the Metropolitan Campuses. I never tire of meeting with our graduates and their families. It was a special week for me because my son graduated. Here is a picture of him with his Mum Anita. I could really relate to how the families at the CQUniversity ceremonies were feeling. We are fast approaching the end of the year and what a year it has been. We have had a great deal of success in our teaching and learning, research and engagement. Our teaching quality was recognised by the Good Universities Guide and with the outcome of our AUQA audit review. We are also seeing an improvement in our student retention which is very pleasing. We are really starting to ramp up our research efforts and I am sure we are going to excel in coming years. It is great to see so many world class researchers choosing CQUniversity as their academic home. We have defined what we mean by engagement - and our efforts are being recognised nationally and internationally. Many of our new programs have gotten off to a great start in 2011. This year we had the highest percentage increase of first preference applications of all the Queensland universities. Many of our staff have been working very hard to write new programs and to renew programs for next year and we are seeing very strong applications for 2012 – this is all very good news. We have also received quite a few early Christmas presents this year. The Federal Government has awarded us more than $70m in SAF and EIF funding (see previous blog) and we have also won over $3m in HEPPP funding which will help us to improve university participation in Central Queensland. On top of this we have been given over $2.5m from BMC and BMA for scholarships. Success follows success and we certainly are very successful! So the year comes to an end on a high note. I want to thank all the staff of CQUniversity, including those employed through our C Management Services subsidiary, for their hard work this year in moving us towards being one of Australia's truly great universities. In this respect I would also like to thank those who do not work directly for the University but who have also contributed greatly over the past year. This includes Council Members, Engagement Committee members, work placement supervisors, volunteers, alumni and community supporters. Thanks to you all. I get the feeling 2012 is going to be an even bigger year, with more programs being introduced, many exciting new campus developments and a time when we will be celebrating our 20th anniversary since becoming a university. I am off early this year for a Christmas break. It is Anita’s 50th birthday on Saturday and we are having a party in Cairns so I am really looking forward to that. Have a safe and happy Christmas and I look forward to continuing the great work next year. One of the things I love most about my job as VC are the opportunities I have to chat with students – whether it’s at a BBQ lunch on campus, celebrating their success at a graduation ceremony or welcoming them to campus at orientation week – it is always refreshing to remind myself of the role we play in helping students reach their full educational potential. I had the chance to meet Renee, one of our BA Professional Communication students recently, who is currently completing her third and final year at CQUniversity. Over the summer semester, Renee is undertaking a work placement with the CQUniversity Corporate Communications team. CQUniversity offers one of the best mixes of classroom and workplace-based learning of any Australian university and the Corporate Communications team were very keen to have Renee on board for this opportunity. Interestingly enough, the project Renee has been tasked with during her placement is CQUniversity’s 20th anniversary celebrations. 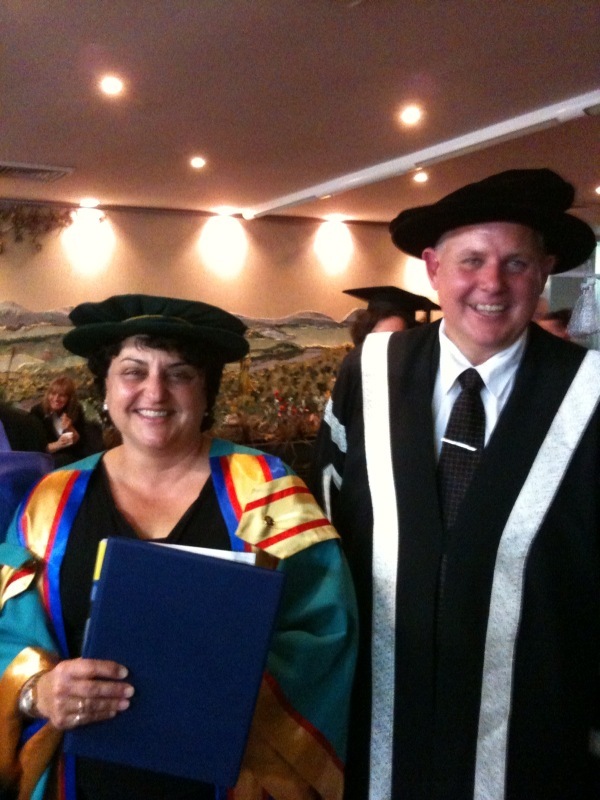 2012 is a very special year for CQUniversity – and Renee. Although founded in 1967 as an institute of technology, 1992 was the year we gained full university status. Renee just happens to be holding her own ‘20th celebrations’ next year as she was born the same year we became a university. You might say 20 years doesn’t seem very long in the world of higher education and you’d be right. I like to think of us as being ’20 years young’. One definition I found for young was “being in the first part or period of growth”. I think this describes CQUniversity’s current period of renewal perfectly – this is only the beginning – there are bigger and better things to come. We have a unique history and a most interesting story to tell. There are countless achievements and successes to be proud of over the past twenty years and I’m very excited to have CQUniversity’s Professor Denis Cryle compile our history since 1992. You’ll be hearing more about our plans to celebrate our 20th anniversary and I’m sure Renee will do us proud – as one of our students – to help bring this all together. It’s been a long time coming, but we finally have confirmation! It was extremely pleasing to receive official word from the Commonwealth Government last week regarding our funding application for higher education investment monies. CQUniversity has received $73.8m, part of a total pool of $377m from the Structural Adjustment Fund (SAF) and Education Investment Fund (EIF) for 2011. These funds will allow the University to enter its next phase of development and is a major step forward in the process to revolutionise post-schooling education to better meet the unique skills needs of this region. At a special briefing event held this morning to mark the funding announcement, it was fantastic to be joined by so many supporters such as Member for Capricornia Kirsten Livermore and Central Queensland Institute of TAFE Director Gary Kinnon. A large crowd of university and TAFE staff joined with community members, Rockhampton region Mayor, Councillors and representatives from Capricorn Enterprise, the CQ NRL Bid and Central Queensland Indigenous Development to hear how the funding would be utilised. • a further stage of the public-access allied health clinic at CQUniversity Rockhampton. I believe this funding announcement demonstrates just how crucial CQUniversity is to the national higher education sector and to the communities of the booming Central Queensland region. These funds represent one fifth of the overall SAF/EIF funding pool for 2011, which is a massive vote of confidence from the Government in the CQUniversity, and our plans for dual-sector status and the development of a world-class engineering school in Mackay. I look forward to sharing more details about these projects as they progress, but for now, I would like to express my thanks to the Commonwealth Government for its foresight in recognising the immense contribution a dual-sector university, offering world-class engineering programs, will make to a region like Central Queensland and to the many staff who helped put this funding application together – it has certainly been worth the effort. Earlier this year, CQUniversity was extremely fortunate to appoint one of its senior researchers – Professor Brenda Happell – as an Engaged Research Chair for Mental Health Nursing. We always knew at CQUni that Brenda was an amazing person – an esteemed researcher and Professor with a highly-regarded research track record. 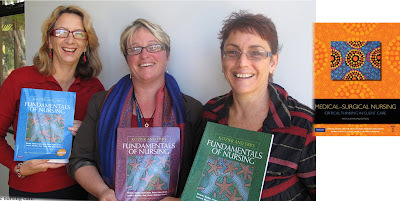 So I was delighted to see a recent Journal of Clinical Nursing (JCN) article confirm what many of us already know – that Brenda is one of Australia’s top nursing academics, based on a detailed analysis of research publications undertaken by the JCN. The analysis of research citations published in the JCN includes a special index where a score between 10 and 14 indicates an ‘excellent publication record'. Professor Happell's special index of 20 puts her in the top three on the ranking table. 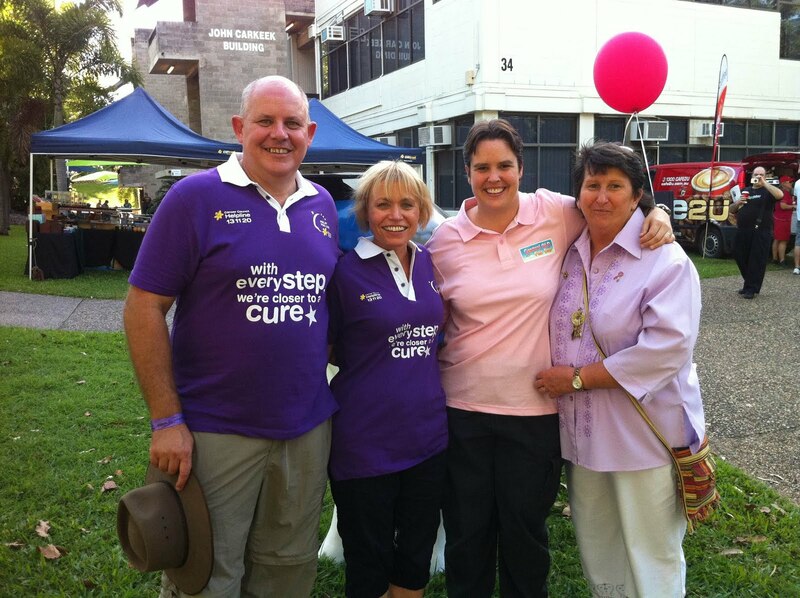 CQUniversity has a strong and proud history in the nursing discipline. From our first offerings on the Rockhampton campus, we have now expanded to be located on another four campuses of CQUniversity – Mackay, Bundaberg, Noosa and Emerald – with both on-campus and distance learning. 2012 will see CQUniversity celebrating not only 20 years as a university, but also celebrating 20 years of graduating nursing students. Whilst we are extremely proud of Brenda’s ranking in the JCN, it is the dedication and skill of Brenda and her colleagues that we are most proud of. I had a very busy and productive visit to Brisbane earlier this week. I was very honoured to join the Deputy Premier and Treasurer Andrew Fraser for the launch of a new industry-led peak body the Study Queensland Industry Council (SQIC) on Wednesday. I was invited to be a member of this board – Chaired by Professor Bill Lovegrove, VC of the University of Southern Queensland – which aims to represent Queensland’s international education and training sector on the world stage. CQUniversity is already one of Australia’s leading providers of international education and I believe this peak body will assist greatly with presenting a cooperative and holistic face for Queensland when we market overseas. Mr Fraser spoke yesterday at the launch about how the SQIC will expand Queensland’s reputation as a world-class base for education and training services. Education services are already Queensland’s third largest export industry, generating over $2.8 billion in export revenue in 2009-10 and providing jobs for around 17,000 Queenslanders – and CQUniversity is very proud to play a major part in this. 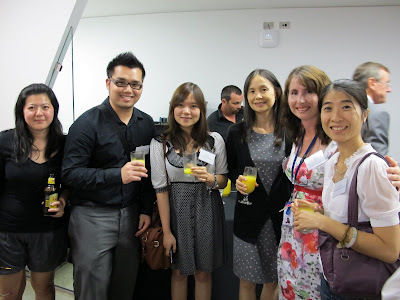 Internationalisation permeates all aspects of CQUniversity and the concept of international activity is not new to us. Over the past two decades, CQUniversity has grown to be multi-campus, multi-city university focused on preparing highly diverse learners for internationally-engaged and effective professional practice wherever they may be situated. I think Queensland will have plenty to gain by boosting cooperation among providers, as international students may wish to experience ‘lifestyle’ study locations along the coast as well as city and rural campuses, while moving seamlessly between vocational and tertiary programs. Speaking of our international students, I had a great evening with a group of CQUniversity Alumni in Brisbane following the launch of SQIC yesterday. Chancellor, Rennie Fritschy and I joined staff from the Brisbane campus and our Office of Development and Graduate Relations to host a reception for graduates and university donors. It was wonderful to hear stories about what our alumni have been up to since graduating and all said it was a nice feeling to be back ‘on campus’. This was also an opportunity for me to thank our donors and other supporters as we truly value these relationships and love catching up with past students whenever possible. Things are progressing at a steady pace with our aim to be Queensland’s first dual-sector university. Since the Queensland Premier, Anna Bligh paid us a visit in August this year to announce her approval for merger talks to proceed between CQUniversity and Central Queensland Institute of TAFE (CQIT) (see previous blog), I am pleased to say I was in Brisbane recently to meet with Julie Grantham, Director-General of the Department of Education and Training (DET) (pictured). During this visit, Julie and I signed a Heads of Agreement document between the State of Queensland (represented by DET) and CQUniversity that records another significant milestone in the progress of the proposed merger between CQUniversity and CQIT. 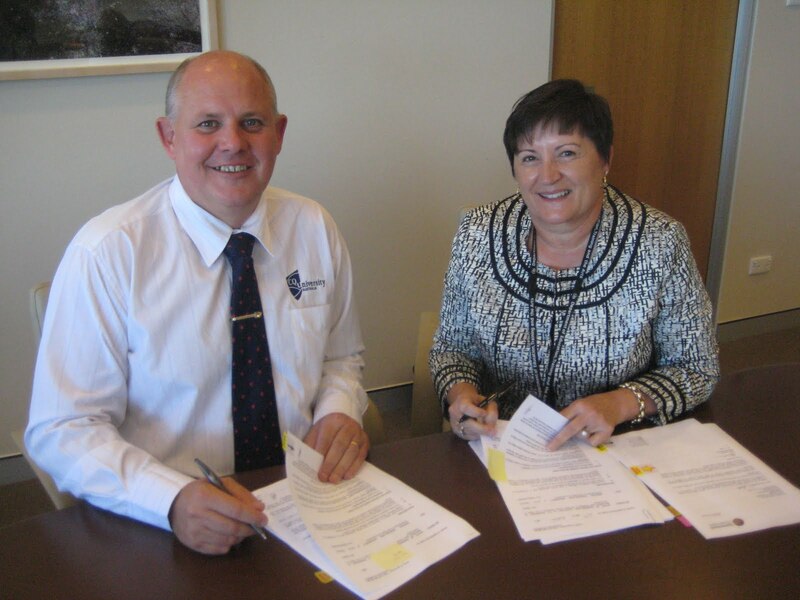 This agreement commits CQUniversity and DET to more intensive negotiations leading to a detailed merger agreement down the track. I am looking forward to continuing the work we are undertaking with DET and CQIT to ensure this proposal achieves a positive outcome not only for the Government, CQIT and CQUniversity, but most importantly for the communities in Central Queensland. Whilst we are waiting to hear from the Federal Government about our application for funding which will assist with this process, Deputy Vice-Chancellor, Nik Babovic and his team are working hard to ensure we are ready to proceed to the next level of our journey to dual-sector status. I’m sure this will pay off in years to come with greater study choices and career pathways for our regional students, helping them tap into our ongoing resources boom. I look forward to sharing more information with you as progress is made. Figures released recently by the Minister for Tertiary Education, Senator Chris Evans, paint a very bright future for Australia’s universities. It is pleasing indeed to see operating surpluses on the increase, revenue for the sector up 8.2% and Government funding increased by 8.9% in 2010. CQUniversity was attributed as having an operating deficit for 2010 in this DEEWR report - Finance 2010: Financial reports of Higher Education Providers – which on the surface, may be cause for concern, but when put into context, comes as no surprise given our current rate of rapid expansion. These figures are based on information we provided to the government for the 2010 reporting period and if you look closely at other sections of the report, it shows CQUniversity to have a ‘retained surplus’ of $205 million and a ‘total equity’ value of $284 million. So, what does this all mean exactly? To put it simply, it means we have been using a large portion of ‘our own money’ to fund a rapid expansion of infrastructure, research and academic talent and fresh degree programs over the past two years. The University Council and I made a commitment when I was appointed Vice-Chancellor that we would ‘put our money where our mouth is’ and reinvigorate investment in our future and embark on a path of renewal at CQUniversity. The first major milestone of CQUniversity’s Renewal Plan was to be financially sustainable by 2011 – and I am very pleased to say that we have achieved this goal. CQUniversity’s finances are in good position which means we have been able to draw largely on our own resources, knowing there is still plenty of ‘money in the bank’ to retain an overall surplus. Dozens of projects are contributing to the university’s renewal program of upgrading teaching infrastructure and building new teaching and community facilities such as a multi-million dollar relocation of CQUniversity Brisbane; a brand new 72 room student accommodation facility and medical science laboratories in Mackay (pictured above); a $13M allied health clinic and $10.5M redevelopment of our engineering teaching precinct in Rockhampton; construction of sonography laboratories in Sydney and refurbishment of research centres in Adelaide and Rockhampton to name just a few. It could be argued we are Queensland’s fastest growing university and if anything, the table contained in the DEEWR report reflects our ambitious renewal program – we aren’t sitting on our reserves, we are investing it in our future – our students. We are looking forward to 2012 and another strong year of enrolments. We are expanding program and course offerings at all campuses and developing fully-fledged university cities, increasing participation in higher education and addressing workforce needs. In fact, I recently found out our new Paramedic Science program is 65% over enrolled for next year and (unfortunately) we will need to turn students away. So it is all good news – we are not going broke – far from it. I was fortunate enough to travel to the Middle East recently as part of a CQUniversity business delegation along with colleagues Ken Hawkins, Geoff Wessling and Jamie Palmer. Whilst overseas, the Chancellor, Rennie Fritschy and I also travelled to India and Singapore. The Middle East is truly a remarkable part of the world and it was very exciting to explore possibilities such as joint research projects, delivery of training programs for workers in the resource and health sectors and reconnect with CQUniversity alumni who have returned home after completing their studies in Australia. I believe being a leading provider of international education brings with it a responsibility for ‘giving back’ to the students and countries that chose CQUniversity as their preferred study option. During my overseas trip, I was very honoured to officiate CQUniversity’s partnership with one of India’s most progressive NGOs, Salaam Baalak Trust, to improve educational opportunities for Indian students and to provide assistance to street children. This is all part of our aim of being Australia’s most engaged university and helping to facilitate access to higher education for all individuals. My earlier blog on the Salaam Baalak partnership generated some interest from people wanting to know more about how they can be involved with this initiative. Once I have spoken with staff next week, I will post further details about how the wider community can assist CQUniversity with this inspirational programme. I am delighted to announce the appointment of renowned human factors and safety researcher Professor Drew Dawson as CQUniversity’s inaugural Engaged Research Chair. 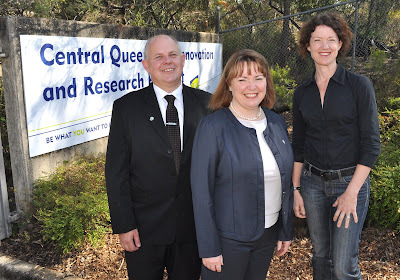 All year I’ve been saying that 2011 is going to be the year of research at CQUniversity and following the acquisition of the former CSIRO laboratories in Rockhampton (see previous Blog), we will now be establishing a research centre in Adelaide – the Appleton Institute. The Appleton Institute will be a hub for South Australian research talent including the Human Factors & Safety Research Centre headed up by Professor Dawson which will help to establish a strong, credible and locally relevant presence for CQUniversity in South Australia. With the ‘power of place’ offered by CQUniversity, Professor Dawson and his team (including lead researchers Associate Professor Sally Ferguson and Associate Professor Greg Roach) will now be able to more effectively apply their cutting edge research to tackling hot-button issues in theresource-rich Central Queensland region as well. The team are considered to be world leaders in the field of sleep research, with expertise in the areas of human sleep, biological rhythms, sleep disorders, workplace fatigue and risk management. With a physical presence in South Australia and a strategic link to Queensland’s mining heartland, this appointment really is a win-win for academia and industry in both states. This is not just about expanding CQUniversity’s geographic footprint – it really is about CQUniversity leveraging the best research talent in the nation, to address issues that have a direct impact on the communities we serve. I am pleased we had the opportunity to acknowledge CQUniversity’s first Vice-Chancellor, the late Dr Arthur Appleton, with the naming of the Appleton Institute. Dr Appleton had strong ties to South Australia through his role as Head of Metallurgy at the South Australian Institute of Technology (now UniSA). The Appleton Institute will occupy the site of the former Royal District Nursing Service headquarters at Wayville and will house a state-of-the-art sleep laboratory and cognitive performance facility. Plans to recruit up to 10 Engaged Research Chairs across a number of disciplines are underway and I look forward to sharing more exciting news with you as progress is made. I am excited to announce that a new state-of-the-art, CQUniversity research precinct – which is set to put Central Queensland on the world map for scientific innovation – is set to be located in the former CSIRO JM Rendel Laboratory in Rockhampton. This facility, one of Australia’s premier livestock research facilities in years gone by, will be transformed into a regional research and innovation powerhouse known as the Central Queensland Innovation and Research Precinct (CQIRP). I cannot overstate how much value CQIRP will generate for this region. Central Queensland – from Mackay to Bundaberg, from Gladstone to Emerald – has limitless untapped potential that is begging to be unlocked through unique research and innovation. We believe CQIRP will provide the key. CQUniversity is embarking on an ambitious agenda of research and innovation resurgence over the next 10 years, which will revolutionise the University and the way we impact on the communities we service. We are therefore putting our money where our mouth is, with plans to inject millions into staffing, resourcing and equipping CQIRP into a truly world-class facility over the next few years. Put simply, this new development will position Central Queensland as the research and innovation capital of regional Australia, with benefits that will continue to flow to the community from today on. We will now begin refurbishing the existing laboratories, with the first active research projects to start moving in by December this year. By 2012, projects covering everything from natural resources, to water, to environmental management, to immunology and preventative health, will be brought ‘in house’. • Engineers Australia once again accrediting our engineering programs for another five years. Well done to Dean of School, Alan McPhail and all his team for their hard work and commitment in achieving this milestone – it mustn’t have been easy undertaking an accreditation exercise at the same time as managing a major refurbishment of the engineering precinct. 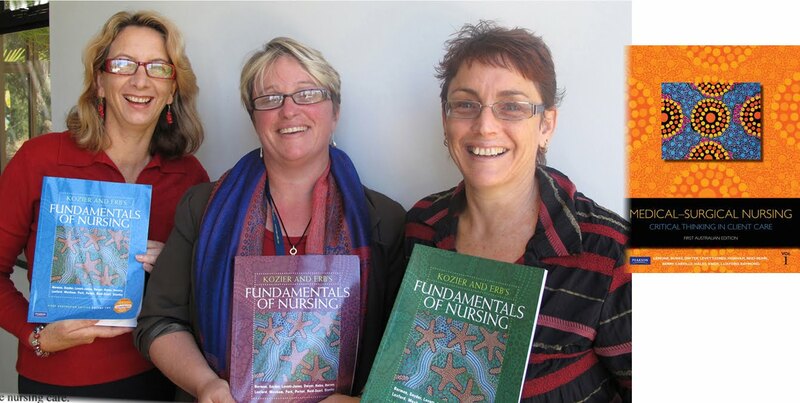 • A group of CQUniversity School of Nursing and Midwifery academics winning a national publishing award, reflecting their contributions to a new Medical-Surgical Nursing Textbook. Congratulations to the CQUniversity contributors - Lorna Moxham, Kerry Reid-Searl, Trudy Dwyer, Judith Applegarth, Sandra Walker, Marc Broadbent and Diane Goldsworthy. • Anthony Welch, Associate Professor in Mental Health Nursing from our Noosa campus winning a national publishing award for his publication entitled Mental Health Nursing: Dimensions of Praxis. Anthony won the Tertiary Education (wholly Australian) - Teaching and Learning Resource Category in the Australian Educational Publishing Awards. • ICT Educator of the Year – our very own Steven Pace from CQUniversity Mackay – featured in The Australian this week for his innovative approach to ICT teaching. • And Lisa Bricknell and Steven Pace receiving their ALTC awards at the Sydney Opera house for their outstanding contributions to student learning. There are no doubt many more success stories to mention - thank you all for making CQUniversity such a great place to be. I am typing this at 30,000 feet somewhere between Sydney and Brisbane on my way back to Central Queensland. I have been in Sydney for the Universities Australia Vice-Chancellors Plenary. These meetings are always interesting. About 38 Vice Chancellors in the same room - I will leave it to your imagination as to what that is like. Before the plenary we discussed a couple of important issues at a workshop: the sector’s response to the demand-led system, and the public profile of universities. The sector has grown very quickly in the lead up to the uncapping of places next year. Many universities have become over-enrolled in advance of the new system. As reported in The Australian recently, CQUniversity is only about 1% above its student cap. I think that most people in the sector agree that the caps on student numbers will not be ‘off’ forever. I have always thought that caps would be put back on once the Government’s target of 40% participation was met. What this means for CQUniversity is that if we want to grow the university (as we do), we need to do this in the next couple of years. This is why we have all been working so hard to put in place new programs that our communities want and need. This hard work will continue next year. The uncapping of places has allowed us to offer new programs such as law, accident forensics, aviation and health. Without the extra student places this would not have been possible. So the new system is working very well for us, but we need to work very hard to get all the new programs we need up and running over the next few years. The other interesting discussion we had was about the public profile of universities. All the research indicates that universities are very well thought of by the public. However it is thought that there is a feeling amongst many politicians that there are not a lot of votes in universities. Other public issues such as health, disabilities and school education seem to be of a higher priority when people are considering how to vote. I think this may be true. The way we become more influential is not to see universities competing with these other priorities - but demonstrating how universities are contributing to these other important priorities. Where would health care, schooling, and solving problems faced by those with disabilities be without universities? I think we have a stronger case than most because of our great emphasis on engagement. Everything we do is linked with our communities and how we can partner with them to help meet their aspirations. I think there is no better way to develop the profile of universities than pursuing an engagement agenda. This will lead to third party endorsements of our university which are much more powerful than us telling those in power how good we are! On a personal note, last week was a wonderful one for me and my wife Anita. Our daughter Anneka and our grandson Owen visited for the week. We all had a ball! Here is a picture of him glazing some pots. I think I had forgotten just how much hard work there is in bringing up a toddler (Owen is 19 months old). I do admire all of our team at the university who are doing such a fantastic job building the university and bringing up a family. I am not sure how you cope - but well done! The Good Universities Guide for 2012 is due for release this week and I am extremely proud to say that CQUniversity has leapt into the top three universities in Queensland – and top 14 nationally – for ‘teaching quality’, with an improved four-star rating. Four stars means that CQUniversity graduates rated our teaching quality higher than at 60 per cent of universities in Australia. This outstanding rating – one of a number of four- and five-star ratings for CQUniversity in the Guide – is a vote of confidence in our ability to attract and retain top academic talent nationally, and I believe we will continue to build on this excellent momentum next year and gain even more plaudits for our quality learning and teaching outcomes. I would like to take this opportunity to thank all of our students who completed the Course Experience Questionnaire (the survey this category is based on) and our dedicated, hard working staff who provide such a quality educational experience. Elsewhere in the Good Universities Guide for 2012, CQUniversity has attracted a total of seven five-star ratings – up from six in the 2011 edition. Building on last year’s success, the University has maintained its five-star status in the crucial area of ‘graduate starting salary’. This rating places us in the top 20 per cent of universities nationally for domestic students in their first full-time job, and is testament to the depth and breadth of our degree offerings and their ability to turn out top-quality graduates. However, the ‘power of place’ remains a crucial factor, and CQUniversity – situated in the resource and agricultural heartland of Queensland – offers real opportunities for graduates to capitalise on the growth industries seeking skilled professionals right here in our own backyard. The University’s strong social charter is also evident in this year’s Guide, with five-star ratings in ‘gender balance’, ‘access by equity groups’, ‘Indigenous participation’ and ‘cultural diversity’. This is great news for our students, staff and our wider CQUniversity community. 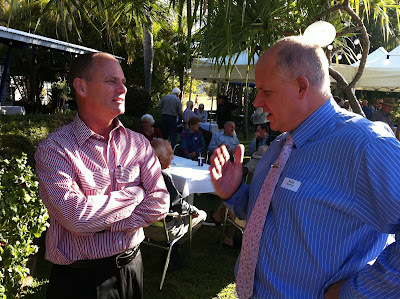 I received an invite to meet with Campbell Newman this week when he was in Yeppoon. I always enjoy any opportunity to talk up our successes with people of influence. And there were quite a few more successes to talk about since my last meeting with Mr Newman in May when he visited our Mackay campus. I was pleased that Mr Newman took a keen interest in the opportunities for the region that a dual-sector university could deliver, and he could see what we were out to achieve with the proposal. It's fantastic to see interest in our dual sector proposal from just about all quarters of government, industry and community. But more importantly it's great that our leaders - whether it be Campbell Newman this week, the Premier last week, or the Minister for Education the week before - are acknowledging the momentum that CQUniversity is building, and are genuinely enthusiastic about our direction. It reassures me that we are on the right path, and our best days are still ahead of us. Today was a big day for the University, the Central Queensland Insitute of TAFE, and the community. Huge actually. We passed a very important milestone in our journey to becoming Queensland's first dual-sector university, with Queensland Premier Anna Bligh announcing approval for the merger between CQUniversity and CQIT to proceed. Premier Bligh (pictured above with CQIT Director Kirsti Kee and myself) was at our Rockhampton campus this morning to make the announcement. This doesn't mean we have merged yet - it's just the starting pistol for negotiations to proceed. The real work starts today. We have to make sure any amalgamation of the two institutions works in the best interest of staff and students of both organisations. We also need to ensure that any amalgamation achieves the best possible outcome for skilling this unique region more effectively; local employers, businesses, industry and the community as a whole will be huge beneficiaries of this dynamic new education and training model if it's done right. And I am confident it will be done right; we simply wouldn't be proceeding with it otherwise. For the duration of our journey to dual-sector status thus far, we have received strong support from the region's schools, industry, employers, local groups like Capricorn Enterprise and GAPDL in Gladstone, local mayors, staff, students, government, and the wider community. This support has helped us get this far, and the continued support of the community will see us reach our goal in the end. Thanks to everyone involved in getting us to this point, I'm looking forward to keeping you updated as we move forward from here. And to our colleagues at CQIT, I'm excited and energised about working with you to build a stronger institution together. I am in India this week. I am here for a number of reasons. On Sunday I took part in the Australian Indian Vice Chancellors Workshop. The senior university executives present discussed ways to better foster engagement between our two countries. Today (Monday) I was part of the inaugural Australia India Education Council AIEC Our Minister for Tertiary Education Chris Evans attended this meeting along with the Indian Minister for Human resource Development Shri Kapil Sibal. The meeting covered skills development as well as higher education. The Council discussed how we could work more closely together. One of the projects adopted by the Council was improving student mobility through amongst other things the development of a credit transfer data base. I have been chosen as the Australian lead for this project. I am looking forward to working with colleagues from Australia and India on this project. I have been looking for ways to further our engagement agenda in India. We have many Indian students and staff and I want to look for ways to engage with Indian communities. On Saturday I think I found a great way of doing this. I spend the day with an organization called Salaam Baalak .This is an organization that takes street children off the streets of Delhi, gives them a home and an education. I took a tour round the back streets of Delhi with a former street child. I also visited a couple of their children homes. I am going to meet with the trust later in the week to look at ways in which the University can engage with this fantastic organization. Watch this space! Some of you may have seen the profile piece on me in today’s Higher Education section of The Australian (if you haven’t, here’s a link). I’d like to thank the editor, Julie Hare, for a well-written, fair and honest look at CQUniversity and my time in the Vice-Chancellor role. Naturally, no journalist can take a fair and balanced look at the history of CQUniversity without mentioning some of the difficulties of the past – and I respect that. However, all universities go through tough times and, like others in the sector, I like to think that we have pushed through those ‘growing pains’ to face a far brighter, far more prosperous future than our past critics could have ever imagined. To my colleagues, our students, our stakeholders and our friends in the sector, I say this: let’s learn from the past, but let’s not dwell on it. CQUniversity is well on the path towards its aim of being Australia’s most engaged university and, eventually, one of Australia’s truly great universities. There is plenty more ‘good news’ to come. I have just got back from a couple of days at our Gladstone campus. I am very pleased to report that the campus is going from strength to strength under the leadership of Professor Chad Hewitt (picture below). As with all other parts of the university our challenges in Gladstone are challenges of success. We have have seen record student enrollments on the Gladstone campus along with our highest levels of research activity. All this means that we have many more staff based in Gladstone. This in turn means that office space is just about fully occupied. With the industry boom in Gladstone our students and staff are having problems finding accommodation in the town. These are problems that we are going to have to address over the next few months if we are going to make the most of all the opportunities that Gladstone offers. You can hear Chad talking about Gladstone click here. There is an interesting story in The Australian today about me and the University. It goes over the past quite a bit but does give a good overview of the potential for the region and how we are moving the University forward. While in Gladstone I also took the opportunity to tour some of the industries based there. Gladstone has $72 billion worth of projects planed over the next few years - yes billion! I understand there is a similar magnitude of projects planned for Mackay! CQUniversity really is in the right place at the right time. But to make the most of all of this opportunity we will need to engage more fully with industry. Yes I know we are doing a heck of a lot as evidenced by the CQUniversity News page. But we need to do even more. This is the reason why I have made industry engagement my number one VC priority for 2012. We will be doing a lot more over the next year to partner with industries to help them meet their aspirations. In doing so we will move closer to our goal of being Australia's most engaged university. It will also contribute to building our region - our home. Becoming a dual sector university will also contribute immeasurably to our goal of better industry engagement. Nik Babovik our Deputy Vice Chancellor (Industry and VET) and the pathways team are already spending a lot of time with industry looking for better ways to work with them. We all have a part to play in making ours the most engaged university in Australia. To this end I hope all of the CQUniversity team will work with me to make industry engagement a top priority. It was great to get out this lunch time and meet with some of our students on the Rockhampton campus. The event was organised by the Student Association - many thanks Brendon and team. Also thanks to Sandy and Toni from my office for helping out. We had about 300 students turn up for lunch. You cannot help but be impressed when you meet our students. All are keen to engage with the University and make their mark on the world. They were full of praise for our programs and staff. It is good to get out and about to hear all this positive feedback - sometimes all I hear in my office is the bad news. Of course there was some positive critism about how we are operating. This included quite a lot of advice on how we can be more environmentally sustainable. Thanks - this will be taken on board. As part of our strategic planning process I set priorities for the coming year. Here are my priorities for 2012. Over next few days I will talk about each of these on this blog. § Engagement with Local, National and International Industry - Engagement and the power of place underpin CQUniversity’s connections with industry in Central Queensland. In 2012, as CQUniversity moves to become Queensland’s first dual-sector University, we will forge closer alliances with key industry partners to better understand and exploit factors around learning and teaching, research and community engagement which contribute toward sustainable Central Queensland cities. Through CQUniversity’s Institute for Resources Industries and Sustainability and our Bundaberg, Mackay, Rockhampton and Gladstone campuses, we will share our physical and intellectual space with stakeholders to explore social, economic and environmental aspects of Central Queensland’s increased industrial development, especially as it pertains to mining, minerals processing, energy, agriculture, tourism, health and education. We will also work with our industry partners to develop new program and course offerings, delivery modes, delivery locations (on-campus and distance education), and decisions about future program areas. Workplace-based learning models – such as our engineering co-op program – are contextualising knowledge, preparing graduates for the workplace, utilising dispersed resources, building on current good practice, and providing excellent outcomes for students. With partners such as Anglo Coal, BHP Billiton and John Holland Group, CQUniversity learning and teaching provides real world context. § The First Year Experience with special emphasis on attrition - CQUniversity is committed to enhancing our students’ First Year Experience which is critical to their continued learning success. Students who achieve positive outcomes in their first year of study are more likely to reinforce their commitment to the University, have a positive program experience and complete their program of study. Attrition figures for CQUniversity for first year students have remained above the sector average for the past five years (DEEWR 2010). However, CQUniversity traditionally attracts a larger proportion of students who fall within one or more of the identified equity groups. Studies have shown attrition rates are often higher within these groups. The 2012 priority is to continue to work towards and develop strategies to improve student retention particularly in curriculum development and in connecting to the lives of our students. This signals to our students the importance of their success in their learning journey particularly the First Year Experience. CQUniversity is committed to the gains already made in supporting increased student responses and feedback on programs, courses, teaching and research supervision. The 2012 priority is to focus on the student voice to further enrich curriculum and professional development activities and to close the loop in terms of reflective practice in the quality enhancement process. § Building Research Capacity - CQUniversity is committed to research that contributes knowledge and innovation through fundamental and applied research in selected priority areas. Our research activity has been aligned to the relevant State and national priorities and funding and is directed to these priority areas to support development and growth. The 2012 priority is to implement the Engaged Research Chairs program, focus the Faculties, Divisions (through service engagement), Campuses, Institutes, and Centres on research growth not only to participate in external funding ventures, but also to increase our RHD students and completions. Building research capacity is central to our vision and mission as a University. § Engaging with our communities and stakeholders - CQUniversity is committed to becoming one of Australia’s most engaged universities. It is at the forefront of providing access to higher education for all individuals. The solution to many of the challenges facing CQUniversity is at its heart – its communities and its “power of place. The “power of place” has not yet been fully realised within the University. It is through engaging with our communities and stakeholders that this priority will be addressed. More specifically, the 2012 priority is to continue to strengthen and build our relationships, promote participation of our students and staff in engagement activities and provide a high level of engaged service to our communities and stakeholders and within the University. I know that working at CQUniversity we all have to work on weekends from time to time. However it is always good to spend the weekend doing something completely different. I have many hobbies. Most of you would know I am into aviation and have plane based at Rocky airport. My other main pastime is pottery. I have set up a workshop in the shed at the VC residence which includes a wheel and kiln. This weekend I have done a glaze firing. Here is a picture of some of the items that came out of the kiln earlier today - I did not say I was any good at it! One of my pottery projects at the moment is to use clay from Central Queensland to make pots. There is an old clay pit down by the Rocky airport. It would be good if I could find clay from each of the communities where we are based. Let me know if you know of any clay on or near the other campuses. Here is an example of a small dish made from clay from Rocky. This is made with the raw clay direct from the ground. I am looking at ways to refine the clay to make it more workable. This pot was fired in the kiln then put into a fire pit in the garden with metal oxides around it. I am hopeful that I will be able to refine this kind of work so that I can give it as presents to university visitors. I like the idea of visitors taking a small part of C Q away with them. I hope you are having an enjoyable weekend doing whatever you enjoy. If you make pots do send me some pictures of your work. Two years ago we started on out path of renewal for CQUniversity. We set the 2 year goal to make the university financially sustainable. I am very pleased to say that we have achieved this goal. CQUniversity’s finances are in a good position. I have been very impressed by the stewardship that out CFO David Turner has provided in this area. But this goal has not been reached by the work of David alone. Everyone in the University can be proud of the work they have done to get us into a such a good position. However I have included a picture of David here because of his hard work, because he is with his partner Barbara who also contributes a lot to the University and because he looks so dapper in black tie! In the past 24 months we have developed over 20 new programs, we have about the same number in the pipeline and we have removed programs that have run their course. All of this has increased our domestic enrolments by over 10% this year. We are over our government enrolment cap for the first time in many years. Yes we have had a turn down in international numbers – but this could have been much worse without the hard work and dedication of our fantastic people working on the metropolitan campuses. Let us not forget that even with the turn down in international numbers our CMS operation is still contributing massively to the finances of the university. We have made savings across the board and seen efficiency gains across the board. We also managed to be one of the first universities to settle its EB negotiations – thanks to the hard work of the university negotiating team and the unions. We have made massive investments for the future including campus expansions, new laboratories and even new campuses. So I think we can safely say our first goal has been reached. We now need to work toward our 5 year goal of being a really strong regional university meeting the educational and research needs of our communities and which underpins our national operations. And of course we also need to work in parallel towards our 10 year goal of being one of Australia’s great universities by us becoming Australia’s most engaged University. Well done to all CQUniversity staff in making such a great start to our renewal process. In the past universities such as CQUniversity have had a cap on how many domestic students we can take. This has made it quite difficult to start new programs - we simply did not have the places to assign to those programs. Next year the government will lift these caps and we will be able to take as many students as want to come to the university. This offers us a great opportunity to grow CQUniversity to a size that best meets the needs of our communities. So our enrollments this year are up about 10% making us one of the fastest growing universities in Queensland. It has also allowed us to start programs such as law and paramedical studies. Some have worried about the competition that the demand led system would bring. If we can grow so can all the other universities. Would students be attracted away from our region? Personally I do not share these worries. We are offering and developing much needed quality programs and that is why we are growing. We will all have to work hard over the next few years while the caps are off to make the best use this fantastic opportunity. I have decided to take the next step in digital communication and become a twitterer. Someone asked me yesterday why I bothered to blog and now twitter. Good question. The simple answer is I really want to work in partnership with all the stakeholders in CQUniversity to build a great university. Now there is a terrible word "stakeholder". It really is management speak. What I mean is people - people who I can work with. This includes students, fellow workers and people from our communities. Without electronic communication I simply could not get to speak to all of you. This blog gets about 2600 views per month. That's a lot of communication. This communication needs to be two way - so please comment on these blogs and feel free to email me. So the next step in this communication is twitter. You can follow me as CQUniversityVC. I will get a twitter button added to this site - I will need help - that level of technology is way beyond me. By the way I was really pleased to hear about the work that our Dr Alison Jones has been doing on the reef. She and colleagues have shed light onto how fish use tools. how cool is that? Read more here. Alison is yet another one of our star researchers. She is making quite a name for herself in observing rare marine phenomena. You may remember her video of the giant puffer fish last year. You can view that here. This is a picture of Alison out on the reef. Anita and I were very privileged last year to spend a day out on the reef with Alison. What a star! I have spent the past few days in Canberra talking to politicians and their advisors. The main reasons for the visit was to inform people about our renewal plan progress and to talk about our plans to become a dual sector university. I also got the chance to go in the gallery for question time yesterday - it made VCAC and academic board look very tame. The Decision Makers in Canberra are very supportive of what we are doing and can see that our dual sector plans will really benefit our community in Central Queensland. It was good to have Nik Babovic our Deputy Vice Chancellor (Vocational Education and Training). He has the knowledge and expertise to demonstrate that we really know what we are doing in this new exciting venture. I am still very hopeful that we will merge with Central Queensland Institute of TAFE. The main benefit of a merger will be teaming up with the CQIT staff team. They will have the expertise to to make the new dual sector merger a success, to really take us forward in the VET area. I really believe that there will be a great synergy between the TAFE and the University. Together we can be much more than the sum of our parts. I am very pleased to hear that there as been a lot of progress back at base since I have been away. I was particularly pleased to hear about the successful professional accreditation of our property degree specializations. Yesterday I saw a sign at parliament house - danger icy surface. It will be great get back to sunny Queensland at least our warning signs are only about snakes. I am writing this in Canberra. I am down here to meet with politicians to let them know how we are going at CQUniversity. All in all I think I have 17 meetings planned! These visits (which I try and do quite often) also give me a chance to hear how people are perceiving how we are progressing. I am sure the dual sector university plans will be close to the top of the list of discussions with most people. They will also be interested to hear about how we are progressing with the renewal plan in general. There is a lot of progress to report. Yesterday I attended the women's leadership breakfast organized by Barabara Lawrence. The speaker was Mary Carol from Capricorn Enterprise. What a fascinating life story she has! One of eleven children who has gone from success to success. She is a great supporter of the CQUnivsity. If you ever get the chance to her her speak do take that opportunity. The picture in this post is of Mary and Barbara. Before I caught the plane I sat on the Audit and Risk committee and Planning and Resources committee. The agenda's of these meetings make you realize just how much we have going on at the moment. New programs, new campuses, new buildings, dual sector negotiations and overseas developments. I believe that we have to do all of this at this time. This really is our time. Our time to build an improved university to meet the needs of all our communities. I know this is meaning a lot of hard work for many in the University - and I thank you for the effort you are putting inat the moment. I think you only have to look around the place to see that your effort is paying off! It is about zero degrees down here at the moment. It is always good to come down here at this time of year. It reminds you why you choose to live in Queensland. Last evening I had the pleasure of attending the closing of the CQUniversity Science Camp in Rockhampton. This was a camp we held for local year 12 students who are interested in science. We had a fantastic group of students who came and spent a few days on campus. They did work in our laboratories and had presentations from our scientists and speakers from outside the University. The event ended with them giving presentations on sustainability. 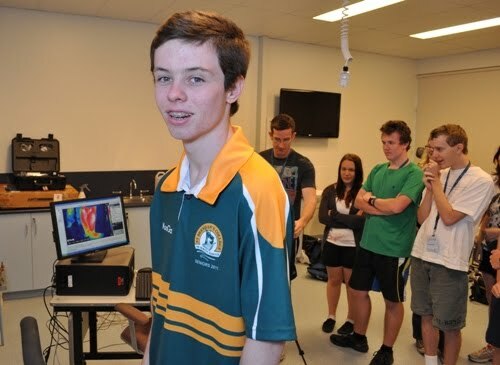 It was very clear that they had really enjoyed being part of CQUniversity for a few days. I really want to thank the staff that were involved in this. You gave up your valuable time in a non-teaching week. You did the University a great service in showing local students and schools what we have to offer at our University. However I think your contribution was even greater than this - you helped to encourage a group of very talented youngsters to seriously consider science and health science! I am just off to term two student orientation. Our offers for term two are up 40% on last year! If you remember they were also up last year. Yesterday I met with the new International students. What a great bunch they were! All our hard work is really paying off - CQUniversity just gets more and more successful. I am really looking forward to meeting the new students! Yesterday I spoke at the Australasian Syllabus Plus Reference Group (ASPRG) conference. Syllabus Plus is a major piece of software that is used to time table in universities. This really got me thinking about time tabling - something that I admit I rarely do. The two major (expensive) resources that we have in our university are people and our facilities. It is interesting that we invest a great deal in the management of people through our People and Culture Directorate - but relatively little on the management of our facilities. Yes I know we have our Facilities Management Directorate - but they are mainly concerned with the maintenance and construction of our buildings. The timetablers are the people that manage the utilization of our facilities. These are the guys who make sure the University gets the best return on it's investment on infrastructure. Like many people in the University they are the unsung heroes of the place. The people who are often forgotten - unless something goes wrong. There are so many people in the University who have difficult complex jobs who keep the place running. We are moving to recognize these unsung heroes through events such as the professional show case and the professional staff conference. We need to do more of this. Can I take this opportunity to thank all the unsung heroes in our University. THANKS. So here I am sitting waiting for a delayed flight back to Rocky. What a great way to spend a Saturday morning! Still it has been a good week. 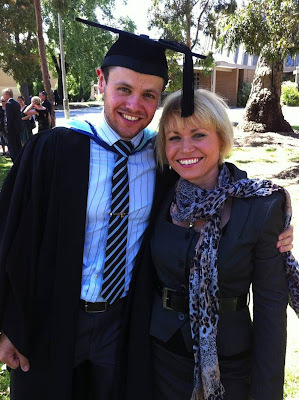 I have been at graduations in Brisbane, Melbourne and Sydney. Next term we are going to start delivering our business program in Geraldton in WA. It really makes you appreciate that we truly are a national university. In fact an international university if you consider our campus in Singapore and our mix of students. We are really exporting our power of place. As always with the graduations the best part was meeting with our graduates and their families afterwards. We have people traveling to Australia from all over the world to be part of the graduation. I do urge you to try and attend a graduation at one of our Metropolitan campuses - they really are inspirational. This has been a week of anticipation. Will we manage to secure the CSIRO building in Rocky, will the merger with CQIT happen and how well we go in the budget. Well on the whole I think we did very well in the budget. The University will benefit from the continued commitment to indexation of our funds and the increase in rural loading. There are also many opportunities in terms of funding for infrastructure. We just need to make sure we capitalise on these opportunities. We are putting a team together to work on our next EIF bid. Let's hope we go as well with CSIRO and CQIT. I was very honoured to be made a member of REDC the regional economic development board in Mackay. Mackay is one of the fastest growing cities in Australia and it is wonderful that we are university that services this fine city. I am confident that over the next few years we will see Mackay campus grow to be at least as big as the Rocky campus. Having a PVC and Deans based there is really starting to pay dividends. We really are in the right place at the right time. I can think of no other place that I would want the university to be located! On a personal level I am looking forward to the relay for life next weekend. I am doing the 3am to 6am walk - thanks Marc. I am also looking forward to going on leave in June. We are going up to the tip of Cape York with Mark and Deb Burton - expect some interesting blogs! If I ever get home I want to see what pots have emerged from a pit firing I did last week. I think that is how most people at the University are feeling at the moment. But I also think there is a real feeling of progress in the air. All indicators are showing that we are really moving forward. This week we were very privileged to have the Honourable Michael Kirby on campus in Rockhampton to launch our new Law Degree. What a great man he is. He has been compared many times to Lord Denning. I think it is quite fair to say that he is the leading legal mind of our time. It was very interesting to note how he approached the launch of the degree (which he generously did for no cost might I add). It was very obvious that he had read everything there was to read about the degree. He was very complimentary about the innovative nature of the degree - on line, three year duration and very accessible. He also gave us some pointers on how the degree can be made even better and to how we should be looking after our law students. He was very concerned about some recent research that indicates that law students are much more prone to depression than students from any other discipline. This is something we will have to watch out for on our program. Yesterday we saw the federal budget handed down. On the whole I think it is very good for rural/regional universities. We will do well in our funding due to indexation and regional loading, and there is also funding for regional infrastructure. When we become a Dual Sector University we will also hopefully benefit from the extra funding for training that was announced. On that note it was good to welcome Mr Nik Babovik on board last week as our foundation Deputy Vice Chancellor Vocational Education and Training. Domestic applications look very good for our mid-year intake; we are up about 40% on this time last year. This is a great result. Both faculties are doing well - but yet again nursing is the stand out program. International applications and enrolments are not in such a positive position. There is no doubt that our international student numbers are down. Our staff in this area are working very hard under very difficult environmental circumstances. This week I am attending graduations in Brisbane, Sydney and Melbourne; it is always fantastic to see our international students graduate. We have parents fly in from all over the world to see their children reach their important milestone. Internationalisation is at the heart of our University and we will persevere with it through these hard times. This week Anita and I have had a visiting paramedic student staying with us. Having a new academic (Anita) and a student in the house helps to keep me very grounded. It has really made me appreciate how hard both groups work. Both are very complimentary about the University - its staff and processes - it is always good to hear this. On Monday evening I enjoyed meeting applicants for positions we have in our new degrees to come online in Physiotherapy, OT, Speech Pathology and Podiatry. We have already recruited to oral health. Planning for our allied health clinic is going well and we hope to start construction soon. This is just another example of how the University is in change mode. And I think we are going to be in this hectic change mode for at least another two years. It will have to be like this if we are going to make the most of all the opportunities that are available to us. On a personal level I have had a couple of weekends doing very little - I can strongly recommend it! (I apologise to folks that have been working very hard over recent weekends doing res schools.) I have been having a lot of fun making pots; I took pottery when I was at school and have never really lost the love of it. Recently I found an old clay pit in Rockhampton so I have been digging my own clay. Taking clay from the ground and seeing it a few weeks later as a pot gives me a real kick! You may have seen the comment regarding ‘quality control’ posted in response to my previous Blog – Leaps and Bounds. Firstly, CQUniversity is a medium size university and secondly, you ask a very good question – how do we ensure quality control with such a rapid expansion? These new programs have not just appeared overnight. A huge amount of effort by a large number of staff has gone into making these new programs a reality. The establishment of positions such as the DVC(Development), PVC(Learning & Teaching) and Deans of School have been introduced over the past 12 months or so to drive the development and quality of these – and indeed all – of our programs. All programs undergo official CQUniversity academic approval processes and in a lot of cases, external professional body accreditation. Most of our new programs are developed in consultation with peak industry bodies – for example, the Bachelor of Paramedic Science was developed in consultation with Queensland Ambulance and will include clinical placements with the ambulance service. We are not doing this alone – research supports the need for new health and medical science programs in regional Queensland. The AUQA Audit report released earlier this year acknowledged the actions taken by CQUniversity to improve the quality of teaching by addressing the functioning of academic governance structures, establishing the role of Dean of School with greater accountability, and setting up an Office of Learning and Teaching to centralise and coordinate learning and teaching functions under the leadership of the PVC(L&T). I am proud to say that following last year’s audit, CQUniversity has been invited to submit four new entries into the AUQA Good Practice Database – which will make 10 entries in total – which is a collection of systems and activities that are relevant to quality assurance and good outcomes in Australasian higher education. Professor Rob Reed, PVC (L&T) has also been leading a revised approach to student evaluation of courses and work related learning at CQUniversity as part of our on-going reflection and improvement on current practice. CQUniversity’s new Learning and Teaching Quality policy will be presented at VCAC early next month and I look forward to sharing that will staff in the near future. I admit there is some work yet to do in fostering a culture of reflective practice and enhancing a culture of continuous quality improvement – but we are definitely getting there. I make no apology for moving quickly on ambitious reforms and a growth agenda. Today CQUniversity is one of the fastest growing Universities in Queensland. CQUniversity remains one of the top three Australian Universities operating in the International Student market and later this year CQUniversity will become Queensland’s first Dual-Sector University. As I said, I am immensely proud of the progress CQUniversity has made in recent times – I hope you are too. I read the Australian Higher Education Review today and there was a line in an article that got me really fired up. I don’t expect many of you would have seen it – it really was just a throw away line in a story buried deep in the paper – but it reminded me that no matter how hard you try, no matter what you are able to achieve, there is always someone willing to drag you down. I nearly spilt my Corn Flakes when I read that this morning. It really is an outdated, offensive and grossly mis-informed analysis of where CQUniversity is today. Not well placed to expand? The truth is there is no University in Australia today that is better placed to expand than CQUniversity – anyone that has witnessed the unstoppable boom of the resource industry in Central Queensland can tell you that. CQUniversity is today benchmarking the way Universities capitalise on “the power of place”; engaging with the industries and communities from which our region derives its strengths. We enjoy a relationship with our stakeholders that is the envy of most Australian Universities. Losing student load? CQUniversity’s student numbers have risen strongly in the past two years to the point where we are now one of the fastest growing Universities in Queensland. Our Mackay campus alone will be the fastest growing University campus in Australia this decade, with a 12% increase in enrolments this year, and a forecast tripling of student numbers in the next five years. CQUniversity introduced 20 new degrees this year, complimented by a $50 million investment in capital works. We remain one of the top three Australian Universities servicing the International Student market. And later this year CQUniversity will become Queensland’s first Dual-Sector University, with a planned amalgamation with TAFE that would effectively double the size of our operations. CQUniversity has made some amazing leaps and bounds in recent times, of which I am immensely proud. Our transformation in the past two years has been truly remarkable. And I believe our best days are yet to come. So I’m not ashamed to say I take glib criticisms like the one in today’s paper quite personally. We’ve all worked too hard to turn this University around to attract this sort of “analysis”. No doubt we will see more unfair media from time to time – all Universities do. But because of our efforts, because of our journey, because of our fight, this University more than any other has earned the right to be annoyed by this kind of media commentary. Andy Williams sang of Christmas-time as the most wonderful time of the year but frankly, I think he got it wrong. It’s this time of year --- the start of Term 1 and Orientation for thousands of CQUniversity students that’s the most special. 2011 will be an extraordinary year for approximately 4000 commencing students, especially, and CQUniversity overall. We’re currently the fastest growing University in Queensland and are offering truly innovative and in-demand programs – twenty new and refreshed programs -- in areas such Law, Medical & Health Sciences and Engineering. 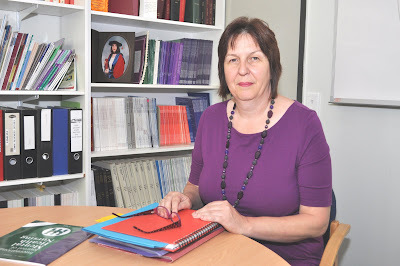 Ours is the only accredited 3-year On-Line Bachelor of Laws in Australia. And our programs in Sonography and Medical Imaging have been developed by world-class experts in partnership with local and international medical providers including the leader in medical imaging, Philips. It’s also a period of renewal and rebirth at CQUniversity, with more than $50million invested – in new Learning & Teaching infrastructure, student accommodations and research development. This year and next you will also witness a resurgence in CQUniversity Research as we engage more effectively with our community stakeholders, recruit new lead investigators and experts and establish research teams that will build on our emerging reputation for world-class research in such areas as Engineering and Medical & Health Sciences. We’ll also be growing fields such as Education, Simulation Science, Human Factors Analysis, Environmental Management and Policy, Clean Energy, Sustainable Regions/Communities, Industrial Ecology and more. At CQUniversity we have a very strong ‘engagement’ agenda. Many of our commencing students will find themselves involved in workplace-related learning in the first months and years of their program. They’ll also find that we want to hear from them frequently and learn from their experiences. I’ll have my second annual I’m All ears Tour this year when I will hold meetings on campus and host a live e-forum on line with students to hear first-hand what it’s like. And I won’t just listen and shrug my shoulders. The conversations I had last year with students have had a direct impact on the academic and support services we’re providing today. Commencing students (and all students) will hear me talk a lot about making CQUniversity a ‘great’ University. They are studying with us during a very special and formative period in our history; one of significant advancement which will benefit all of us and our communities for decades to come. It’s the start of Term 1, so --- as the holiday classic says --- be of good-cheer. After all, it’s the most wonderful time of the year. I walked around Mt Archer this morning and took in the views around Rockhampton and the great “sea” of Rockhampton which wraps around much of the city. I also rescued my plane from the airport on New Year’s day. I have included a picture of what I saw taking off from Rocky airport. I spoke this morning to our colleagues at the University of Southern Queensland in Toowoomba. Amazing and utterly devastating. Tragically, I’ve been informed that some USQ staff are unaccounted for this afternoon – our thoughts and best wishes are with our friends at USQ. We have offered any help we can provide. These floods, now affecting most of the state, have and will continue to have an impact on our students, staff, stakeholders and communities for months and years to come. In the midst of this, CQUniversity has put some financial measures in place to aid some students in need, and over the next few weeks we’ll be directing research funds into projects directly tied to the Central Queensland Flood and the its social, economic and environmental impacts. I’m very pleased that CQUniversity has been able to provide shelter to hundreds of displaced residents and animals at the CQ Community Sports Centre at Rockhampton and at our facilities at the Ag College in Emerald and am very grateful to our Facilities and Security staff, especially, who have liaised with the Red Cross to ensure enough resources are available to manage the evacuation facilities. Some of our staff are stuck, unable to return to their campuses, but are working from other CQUniversity facilities or at home. Many here in CQ– students and staff – are hampered by the flood waters which have yet to really recede. I know, too, that this is also a worrisome time for many of us as we have families and friends in flood-stricken and flood-prone areas. I want you to know that your continued safety and well-being is my utmost priority. We can put processes and procedures in place to deal with flood-related administrative and academic issues, but we can’t replace people. The weather is unpredictable and no doubt there will be more harsh storms and flooding in the weeks to come. Evacuation centres will remain operational for (at least) weeks to come as the communities we serve deal with the aftermath. CQUniversity is and will contribute to the recovery by providing services and expertise. Free mental health care for example is being provided by staff at the CQUniversity Psychology Wellness Centre in Rockhampton. Our experts have been talking with stakeholders about the floods’ impact on the Reef, the long and short-term economic issues we’ll be dealing with, as well as the infrastructure challenges we face across the state. As with other disasters CQUniversity will make donations to causes, in this case to organisations with which we have strong relations through our workplace giving program: the Capricorn Rescue Helicopter, the Royal Flying Doctors, CQUni Cares and more. Alumni and students have approached us wanting to contribute their talent and time as well…. For now, it is business-as-usual best-we-can in most circumstance, as we follow through on our engagement agenda. The construction of new Learning & Teaching and student residences in Mackay is on schedule for completion next month and the ongoing renovations of Rockhampton’s Engineering Precinct and Library are proceeding. Student applications and commencing numbers appear very strong. Some staff will be inconvenienced by the Evacuation Centre operations but I know they will understand under the circumstances. As we prepare for T3 exams and T1 orientation and try to make some sense of the unfolding tragedies let’s please look out for one another and continue to be considerate of the personal circumstances of our friends, colleagues and neighbours.